September 30 is Bike Your Park Day! 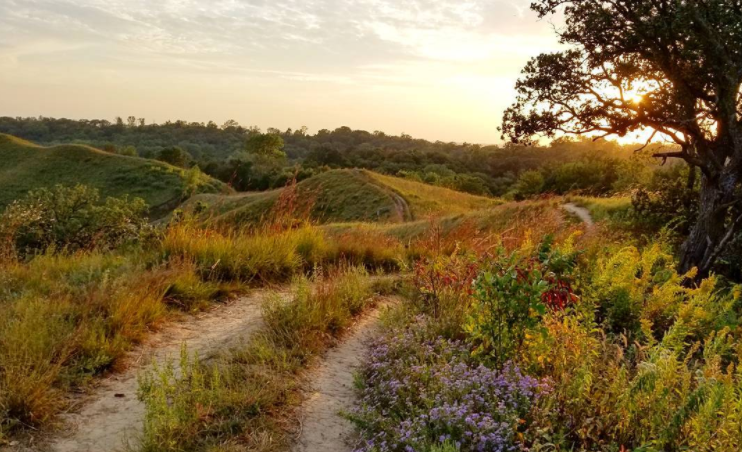 and riders will get to experience some great parks in the Loess Hills. Leaving Hitchcock Nature Center, riders will follow the Historic Lincoln Highway into the town of Crescent, which has several restaurants and a convenience store. You will turn east into the Loess Hills, up a big hill, but then back down onto Mudhollow Road, following a scenic valley into Council Bluffs. Once in Council Bluffs, the second-largest city on the route, you will be routed on city streets through the historic downtown 100 Block and Main Street districts, with numerous eating establishments. The route will then follow city trails along Indian Creek to Lake Manawa State Park, where an educational program will be held. From Manawa, trails connect to a county road that leads south out of Council Bluffs. There will be another educational program at Folsom Point Preserve, managed by The Nature Conservancy. From Folsom Point you will head south along the base of the bluffs to Pacific Junction, where you will turn northeastward following the Keg Creek Valley into Glenwood for camping at Glenwood Lake Park. See the map below for the main (paved) route or click here to open in a new window. View the gravel and dirt route here.